If there is one person in my life who knows the best gifts to buy me, it has to be my aunt. My birthday gift from her and my uncle this year was a meal for two at Edmunds French fine dining restaurant in Brindleyplace. I think it’s fair to say I was thrilled with this, and I felt much the same about the meal itself. I arrived with the other half for a late lunch, the restaurant was quiet so the mood was relaxed and the staff had plenty of time to chat and make you feel welcome. Starting in style, I opted for a glass of Prosecco whilst deliberating over the a la carte menu. All of the dishes looked amazing, but in the end we both decided on the Scallops to start, I chose Barbary Duck Breast for main, while my partner went for Spring Lamb. Almost immediately an amuse bouche of Vichyssoise arrived. Beautifully presented in glass teacups and garnished with pea shoots and garlic olive oil, it was creamy and delicious. My only criticism, I wish it had been a bigger cup! Starters arrived after only a short wait. The scallops were cooked perfectly, caramelised on each side and melt in the mouth tender, served with smoked red pepper puree, aubergine ‘caviar’ and a tomato and olive tartare. The tartare cut the richness of the scallops really well and the combination of the red pepper and aubergine was fabulous. The main dishes were a triumph. My duck was cooked lovely and pink in the middle, with the flavour of the chinese spices subtly enhancing the natural richness of the duck. The sweet butternut squash puree was the perfect accompaniment and the crisp little potato balls were a lovely addition. The spring lamb was also fantastic, as I managed to steal a mouthful. It was meltingly tender and had a really delicious flavour. After devouring the mains, both of us leaving empty plates, it was on to the dessert menu. When I see the word ‘Souffle’ it instantly overshadows everything else on the menu, so I had the toffee souffle with bitter chocolate ice cream, Ste had the chocolate clafoutis with marinated cherries and pistachio ice cream. Before we even got to our desserts, we were delivered a ‘pre-dessert’ of miniature Strawberry Cheesecake. Never has a phrase made me feel happier than ‘pre-dessert’! These tiny cheesecakes were really lovely too, but the real showstoppers were the desserts we chose. The souffle was a performance, as the bitter chocolate ice cream was placed on top and melted into the toffee souffle. It was absolutely divine to eat. As if we hadn’t been spoiled enough, we also had a selection of petit fours with coffee at the end of the meal, with traditional madeleines, coconut rochette, pistachio and strawberry macarons, all of which were delicious. 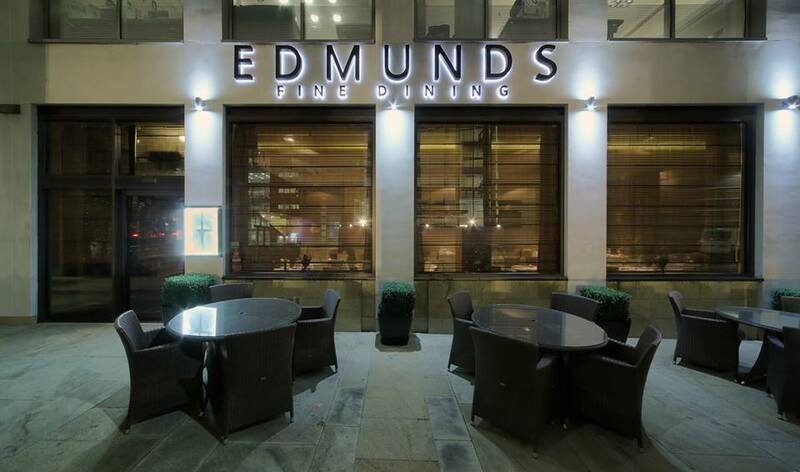 The quality of the food, the presentation and the service at Edmunds was faultless. For a special occassion I wouldn’t hesitate to recommend it, and if you needed any more convincing, there’s an offer until August 29th where you can enjoy 50% off the a la carte menu with the French Kiss promotion.